This week we are installing a variety of Luxury toilets to cater for the VJ celebrations at Westminster Abbey. For large events like this, we at Just Loos have developed ground based vacuum units which can be sited in a marquee or outside. These units are the environmentally friendly option as they require no chemicals. You can pump the waste from them for up to 50 meters, to your nearest drain. Or we can provide waste holding tanks, on site for you. These models like all our units are designed to cater for the luxury end of the market with modern, bright and spacious toilets. They are designed for high foot fall and are perfect for an event like this. When you hire toilets from us, we can help to plan your event and give you the advice you need. We can provide you with a cost effective solution without sacrificing any of the quality. We also have a wide variety of other types, of luxury toilets for hire in London. 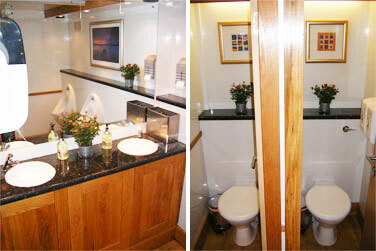 These include our designer washrooms which can be set up in marquees and huge range of Luxury toilet trailers. Chelsea Flower lost its water supply this week. This is good example of the benefits of the Just Loos vacuum flushing trailers because compared to normal toilets that use on average 9L of water per flush. This Sunday we are supplying ground based vacuum units for the VE Day celebrations in St James Park, London.